The St. Scholastica Instrumental Ensemble performs. 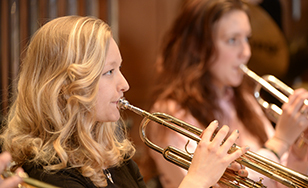 As part of St. Scholastica's Homecoming festivities, the College's Instrumental and Choral Ensembles will present a free community concert at 2 p.m. Saturday, Oct. 15 in the Mitchell Auditorium on campus. Prism Concert: CSS Musical Ensemble Showcase will present a spectrum of music in celebration of homecoming. Attendees will be able to experience the College's variety of musical offerings in a fast-paced sonic kaleidoscope.